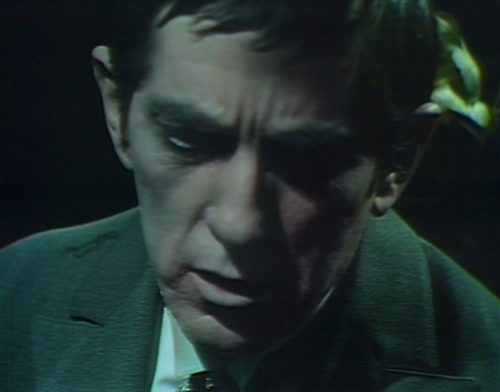 So the deal is that Jonathan Frid has been on vacation for a month, up in Illinois dialing M for murder six times a week, and everybody else has been hanging around the great estate, waiting for him to come back. Take gold-digging aristo wannabe Kitty Hampshire, for example, seen here in one of those “I’m someone else” trances that Kathryn Leigh Scott characters are so susceptible to. This current outbreak began just before Barnabas left, and it will continue for the rest of her life, and ours. “I have come!” she says, to the empty space where a vampire is supposed to be. “I am waiting for you!” And yeah, we all are; we’ve been waiting for weeks, while he pretends to be an unhappily married tennis player with a land line. It’s a shame, because Edward and Kitty are actually a lot of fun together. 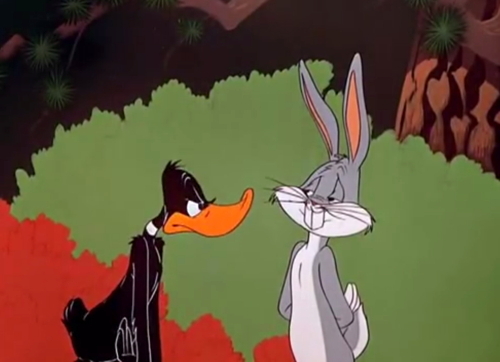 In their spare moments, they’ve been constructing a perfect little doomed romance. She’s come to Collinwood entirely broke, determined to marry Edward for his money. She primps and sighs and rolls her eyes, and invites Edward to come outside with her and find adventure in the moonlight. And it turns out, when there isn’t a gypsy or an irritating sibling around, Edward is actually quite sweet. He’s been very good to Kitty, especially in those weird moments where she seems to lose control of her identity. If he was the stuffed shirt that he seemed to be six months ago, you’d think he would toss Kitty aside, just another crazy dame who could bring the family into disrepute. But instead, he’s been caring for her. I like Edward and Kitty quite a lot. But then she turns haphazardly into Josette, and she just drifts from one set to another. Josette is the worst. She wanders around and stares into space, with wild eyes and a contented smile, murmuring unheralded pronouns. “He told me to meet him here!” she says, and “I’ll go to him anywhere! Anywhere, just tell me!” But as soon as somebody tries to pin her down about who the hell she’s talking about, she transitions back into Kitty, and she doesn’t remember why she’s here. In today’s episode, she starts out hypnotized in Josette’s room. Petofi interrupts her, and she turns back into Kitty, and rushes out. 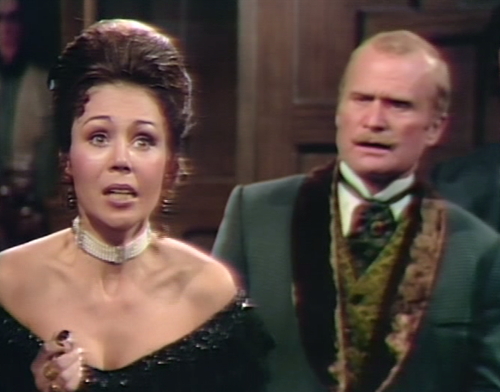 Then she shows up at Collinwood, as Josette. She collapses, and when Edward revives her, she’s Kitty again. She has a fun conversation with Edward, and then Petofi enters with Barnabas’ ring, and she’s hypnotized all over again. That’s three manifestations in twenty-two minutes, which is too many. Now, there is a point to this, although it won’t be clear until the end of the week. I don’t want to give it away, so I’ll just ask you to consider this question: Why do you think they call her Kitty? Because this is all sleight-of-hand, a series of careless misdirections that fix your attention in all the wrong places. Barnabas is coming back, everyone knows that; the show doesn’t work without Barnabas. It hardly even works anyway. So he’s coming back. In today’s episode, that finally becomes a guarantee. Aristede and Petofi have Angelique locked up in the cave where Barnabas was staked last month — this is Petofi’s idea of a joke, apparently. So when her keepers turn their backs, she grabs a big rock and starts breaking the chains around the vampire’s coffin. 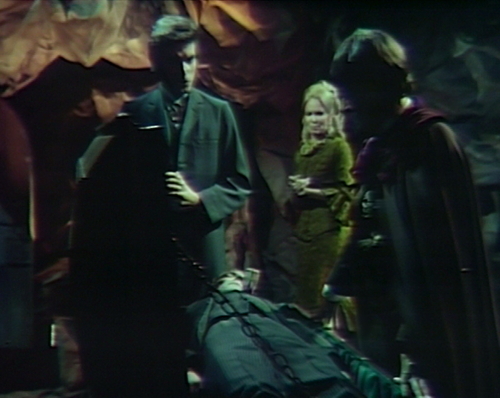 Aristede asks what she’s doing, and she says she’s planning to wake Barnabas up, by pulling the stake out of his heart. Now, technically, we knew that this was possible — we saw Tom Jennings get un-staked last year, to rise and bite again — but everybody’s treated Barnabas’ staking like it was permanent, so we forgot all about that loophole. Things get a little tense in the cave, and when Petofi arrives on the scene a little while later, he finds Aristede holding Angelique at gunpoint. This is what Petofi’s life is like these days, just one lullaby from the loony bin after another. He defuses the situation by saying, oh for Pete’s sake, would you put that back in your pants, which is surprisingly effective. FBI hostage negotiatiors could learn a lot from friend Petofi here. It turns out Petofi’s on Angelique’s side in this particular difference of opinion, because he wants to open up Barnabas’ coffin too. It’s been such a weird week for Petofi that he needs to make sure that the vampire is still in there; that counts as reassurance in Petofi’s world. And there he is! Jonathan Frid, back on the set, to the delight of all. He’s only on screen for about twenty seconds, but that’s all right. There may be people in the audience with limited televisual literacy who actually thought that they would kill the main character in the middle of a storyline, but now even those people have to recognize that the Frid will rise again. It’s the perfect supervillain trick, really, that Ta-DAH! moment when they suddenly return from the dead. Angelique does that a dozen times over the course of the series; it’s the only kind of entrance she ever makes. Now we’ve seen that Barnabas Collins is still in the coffin — the game is Find the Vampire, folks, keep following that card — so they close the lid and throw the chains back on. 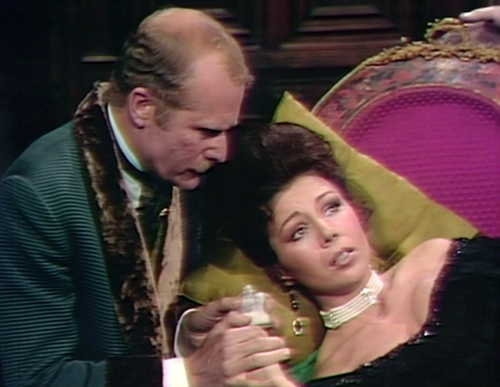 Then Petofi tosses a ring of fire around Angelique, a stunt that used to be an episode-closing smash and now barely registers as an act break. She gets out of it, of course, because nothing kills Angelique, at least not permanently. This time, she hardly gets singed. So Angelique sneaks up behind Aristede, and conks him on the head with a rock — POW! — and then she hightails it back to civilization. Aristede is left there, lying on the ground outside the cave, with no ambulance and no insurance plan. But then, guess what! A dark figure appears. Barnabas, it can’t be you! You were in the coffin, they hammered a stake through your heart! There’s no way you could have survived! And that’s how the game is played. Anybody feel like another round? When Kitty collapses in the drawing room, there’s a bit of yellow marking tape on the floor. 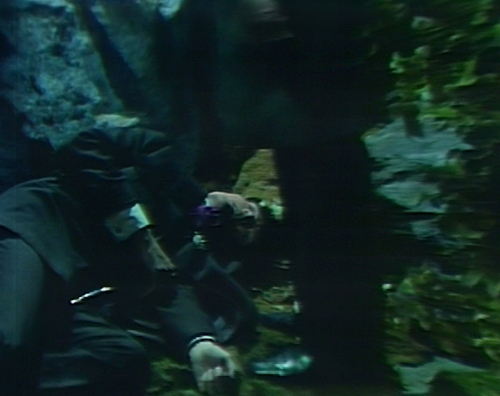 When we see Barnabas’ staked corpse in the coffin, he’s breathing, and his eyes flicker slightly. Aristede has been holding a grudge against Angelique all this time, ever since the first time they met, when she strangled him. He’s finally ready to kill her, but his stupid brain gets in the way. “Why do you think they call her Kitty?” You must have a much, much better (and cleverer) answer in mind, but I’m going to get all literal about it. Has this ever been posted here? It’s pretty funny. Filmed inside Seaview Terrace, it’s a great look at the inside of the real “Collinwood”. The actors playing Julia and Barnabas do a great job. The same actor — the incomparable Darryl Schaffer — plays both Barnabas and Julia, as well as Roger and Pee Wee and a certain surprise guest star. Similarly, many of the other actors play multiple roles. The woman who plays Carolyn is Denise Carey, the owner of Seaview Terrace, and Rudolpho is really her dog. All are great and fun people. There is a sequel called “Curse of the Full Moon.” The teaser trailer is posted on YouTube, but not the full video — yet. That’s the funniest damn thing I’ve seen in months! OMG- Back from the Grave is a too funny parody with spot-on impressions! Normally I’d complain about a poor character going for so long without a costume change, but I absolutely adore that green dress Angélique is wearing. Definitely one of the great TA-DAH moments of the series. 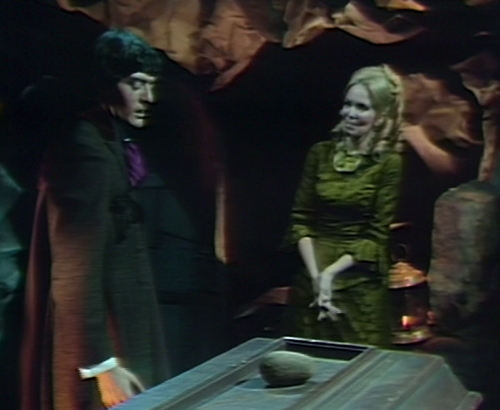 Even though you know it’s coming, it still packs a punch, when Barnabas (?!?) wanders onto the screen. I wonder if #Kitward would have been a thing if twitter had existed when DS aired. And if so, would the story have gone the same direction? I too found them to be a fun couple, even though ultimately Edward is the “distraction” in the triangle. I wondered about this with Tom Jennings, and again now – I thought staking a vampire would kill it – wouldn’t the corpse then decompose? That’s always how it happened in Dracula movies, the vampire turned into a skeleton, or into dust, or mushy bloody goo. I seem to remember that the guy in the Gold Key DS comic book, after being a vampire for only a few pages, burst through a door and fell onto a stake and instantly became a pile of bones. These vampires need to have a clear set of rules! It’s awfully confusing otherwise. thank you for the intro, Richard and Joe. what a wonderful hoot.